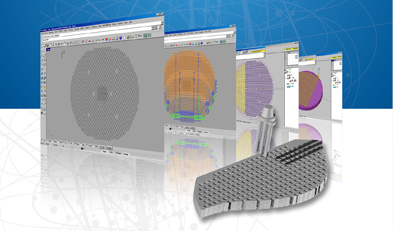 DrillMatrix is a Rhinoceros plug-in used to automatically create a series of holes arranged over a rectangular or rhombus-shaped matrix. Drill Matrix also prepares the machining operations necessary for a full execution of all the holes using both the simple helix tip and a two or three-point multi-spindle head. The peculiarity of tube plates or matrices for die plates of technological materials (Goretex, Nylon, Polyester, Kevlar, Glass, etc.) is the extremely high number of holes. DrillMatrix provides the user with a series of tools to create step by step drilling operations, simply selecting the area composed by crossing networks in which each intersection must be the location of the hole. 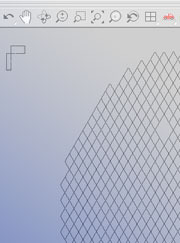 Among the various commands you’ll find the dynamic wireframe or solid simulation, which allows instant verification of calculated cuts, so as to complete the process of creating programs with maximum security and optimization. The processes can be reprocessed at any time for any CNC. Functions are available to select the starting point for the drilling with reference to area to be drilled, as well as the number of tips that will be involved in executing all the holes. In case that the two or three unit multi-spindle head is selected, the tip center distance must be declared; in this case, the cross check between the center distances of the holes and the center distance of the tips is run automatically in order to verify the correct arrangement of the CAD designed elements. 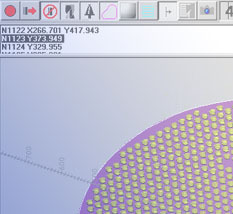 Before running the calculation, DrillMatrix requests the diameter of the hole, which in the CAD environment will allow to trigger the automatic selection through the circle entity; as the last two options, the user is asked to set the tolerance of the check calculation, and whether the user wants to manually add holes for which the position was not included in the initial selection. In all cases, the software processes the position of the holes, optimizing the movements of the tips. When the calculation is complete, there will be a video display of the drilling on the piece with the respective layers of the holes made with one tip, two tips, three tips, and the layer of errors, thus running a control on collision of the tips with the plate to be drilled. At this point, with the help of a 2 1/2 axis CAM (Unicam or Dlog), it is possible to automatically run all the drilling operations divided by each type of tool, whether single or two or three-tip multi-spindle head. 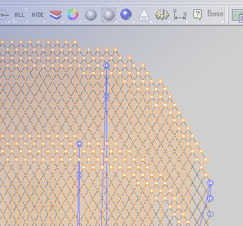 The cnc program allows to first execute all the holes with the three-tip head, then all those with two-tips, and finally those remaining with one tip. At the end of each operation, the tool is exchanged or the machine is placed on hold to allow disassembly operations of the helix tip. The customer can also generate an ISO standard outpit with some fixed cycle.